The FN/FAL quad rail fits both metric and inch pattern FAL rifles. 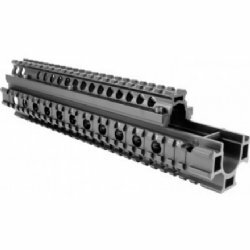 The quad rail design offers plenty of Picatinny rail to mount accessories or forward optics. The T-marked rails allow accessories to be removed and replaced with ease. Fantastic quality and finish, this is a fantastic value. Comes nicely boxed for safe shipping or for storage when not in use.